This post is sponsored by Vitamix. While I was compensated for my time, all opinions are my own. 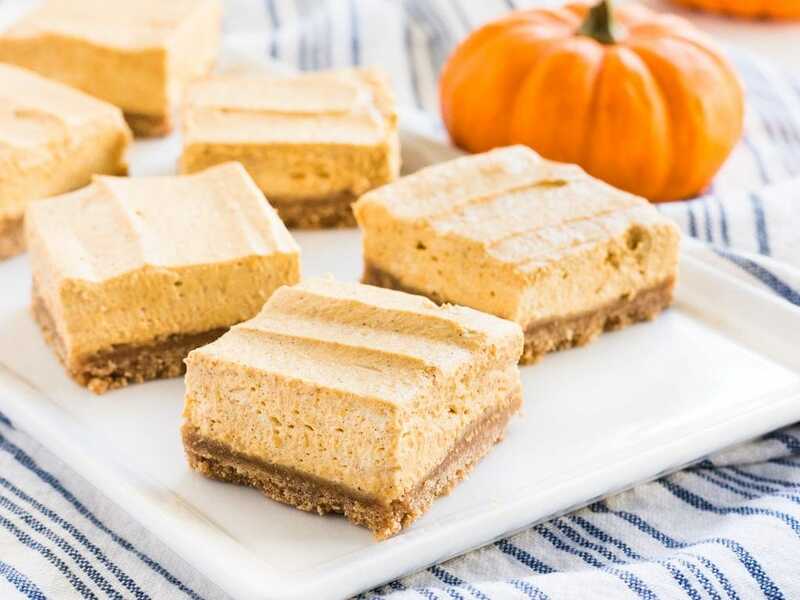 No bake pumpkin cheesecake bars are the perfect fall dessert. The light, creamy pumpkin cheesecake is full of flavor on top of the buttery graham cracker crust. Fall is in full swing and with that comes all the pumpkin desserts. 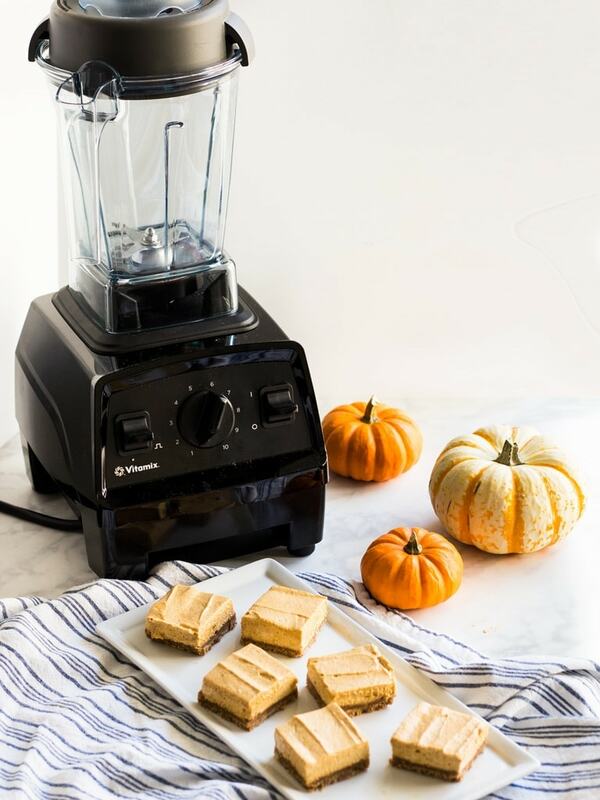 Today I’m sharing my recipe for no bake pumpkin cheesecake bars made in my Vitamix E310 Explorian Series. These bars are full of fall flavor (think pumpkin, cinnamon, nutmeg, ginger, etc.). And since this is a no-bake recipe, the bars will be ready sooner rather than later! Did you know that you can make cheesecake in a blender? Well, you can! It makes the most unbelievably fluffy and smooth cheesecake filling. Seriously, I have never made cheesecake this smooth. It’s as if a pumpkin was in the form of a cloud that melted away in your mouth. Yes, that analogy is out there, but if you ate these pumpkin cheesecake bars, you would know exactly what I’m talking about. Not only is the filling made in my Vitamix blender, but so is the graham cracker crust. The graham crackers are blended into superfine crumbs within seconds. After adding the butter, the graham cracker mixture resembles fine sand and pats perfectly into the bottom of a baking dish. And I think we can all agree that graham cracker crust is the best crust for any kind of cheesecake! Pumpkin cheesecake bars take minutes to make, but some patience is needed. Because this recipe is no bake, the crust needs to freeze, and the filling needs time to chill before serving. Believe me, the extra time is well worth it. The graham cracker crust becomes a solid base in the freezer, and the cheesecake absorbs all the pumpkin spice flavors in the refrigerator. 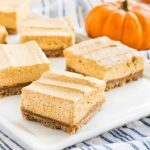 Make these no bake pumpkin cheesecake bars this fall and your friends will thank you (if you can share!). Follow along with the recipe video below to see how easy this recipe is to make with your Vitamix! Line an 8x8-inch baking dish with parchment paper. Grease with nonstick cooking spray and set aside. Place broken graham crackers. brown sugar and cinnamon into the Vitamix container and secure lid. Turn machine on and slowly increase to medium speed. Blend for 30 seconds, or until graham crackers are finely crushed. With the blender running, remove lid plug and pour in melted butter. Resecure lid plug and blend for 15 more seconds, or until mixture forms wet sand. Reduce speed to variable 1 and turn blender off. Transfer graham cracker mixture to prepared pan. Pack the mixture firmly and evenly into the bottom of the pan. Freeze graham cracker crust for 1 hour. Place cream cheese, pumpkin, brown sugar, cinnamon, ginger, nutmeg and vanilla into the Vitamix container and secure lid. Turn machine on and slowly increase to medium speed. Blend for 30 seconds, or until mixture is well combined. Reduce speed to variable 1 and turn blender off. Using a rubber spatula, fold whipped topping into the mixture. Transfer pumpkin cheesecake filling onto prepared graham cracker crust and spread evenly. Gently tap baking pan on the counter to remove any air bubbles. Chill for three hours, or until filling is firm. Cut and serve cold. Store in the refrigerator for up to 5 days. If at any time the ingredients are not combining, simply turn blender off and use a rubber spatula to move ingredients toward the bottom of the blender. Reattach lid and proceed blending. Will it work with an ordinary blender or food processor too? Those layers look perfect. The top looks like pumpkin mousse and I’m so glad they make about 16 squares. 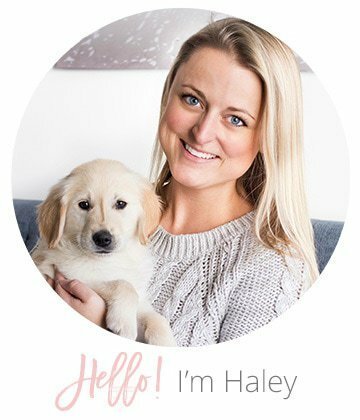 These look fabulous and so perfect for fall! The cheesecake filling looks so airy, fluffy, and just plain delicious. I also like gingersnap or chocolate crust, but I agree graham is the best. I love these bars are no-bake! That sure makes them a lot easier. Yummy combination of flavors. I love no bake recipes. These look great and perfect for fall. Looks so good. Any other flavors this would also work for besides pumpkin? They look so pretty and delicious. Can this recipe be successfully doubled to make these in a 13 x 9 pan?? They sound so wonderful that I would like to share with more than 16 people!!! !